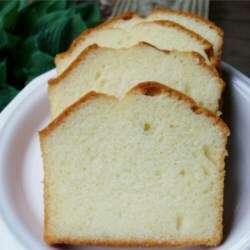 My dad made poundcake often, many times to accompany strawberries.... a nice food memory for me. I researched several cakes and I found this one.... Easy, Rich and Delish..... I broke up the recipes to add a few pound muffins.... for his lunch tomorrow. Pour batter evenly into prepared loaf pans. Bake in the preheated oven for 70 minutes, or until a toothpick inserted into the center of the cakes comes out clean. After removing them from the oven, immediately loosen cake edges with a knife. Allow to cool in pans for 10 minutes, then remove from the pans. Strip off the parchment paper and cool completely on wire racks.